There isn't just one great career path with your masters in finance degree from Vanderbilt. 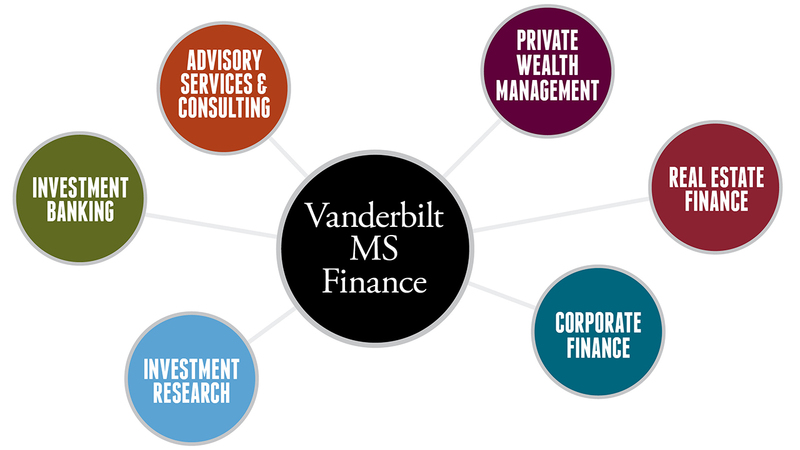 The Vanderbilt MS Finance is a credential that is recognized on Wall Street and around the world and is your key to a wide range of opportunities. Help client corporations acquire capital by creating and issuing debt and equity securities. Play a key role in facilitating financial reorganizations, mergers and acquisitions. Examine and evaluate a firm's financial statements and economic trends. Produce reports and models used by banks or large investors to make portfolio recommendations and decisions. Serve a base of high-net-worth clients by providing comprehensive and personalized financial planning services such as investment and risk management strategies. Produce information that helps a company or client locate, purchase, develop and sell buildings and properties. Ensure the financial well-being of a company by producing financial statements, developing forecasts, creating models, studying potential acquisitions and developing capital spending programs. Conduct expert and independent analyses on matters such as asset valuation or financial issues required for litigation. To see where our students have gone, check out our most recent employment report. In this video interview, Adena Friedman, President and CEO of Nasdaq and Owen Alum, gives advice to students interested in pursuing a career in finance. Throughout the ten-month program, you'll benefit from extensive training and resources at Vanderbilt, all focused on helping you achieve your goal: landing a great job after graduation. A hallmark of the Vanderbilt MS Finance program is the invaluable one-on-one support provided by your student services team, including a dedicated career coach who is there for you at every step in your job search. With the help of your coach, you will consider career paths that best fit your skills and interests. Customize a job search plan. Identify companies in which you are interested. Learn to network. Hone your résumé, interviewing and negotiating skills. Gain access to some of the world's most prestigious companies with the help of our alumni network and on-campus interviewing. For more information on where our students go to work, check out our most recent employment report. ATTN: International Candidates—The Vanderbilt MS Finance program has been designated as a STEM degree program. Under the Optional Practical Training program, international students who graduate from colleges and universities in the United States are able to remain in the country and receive training through work experience for up to 12 months. Students who graduate from a designated STEM degree program can remain for an additional 24 months on an OPT STEM extension for a total of 36 months.